CUTTACK, November 4: A sand sculpture in solidarity with Irom Sharmila’s struggle for Repeal AFSPA was made by famous sand artist Himanshu Shekhar Parida at Cuttack, Orrisa. 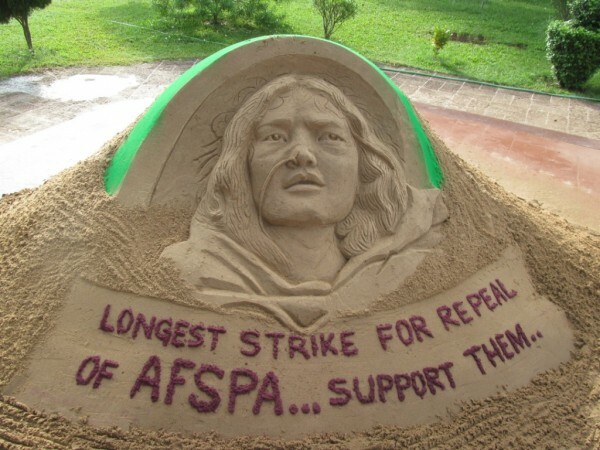 The sand sculpture was made on the call of Save Sharmila Solidarity Campaign where the campaign is observing a nationwide protest to mark 15 years of hunger protest by Irom Sharmila. Himanshu is a young artist and trained in fine arts with his passion in sand sculptures. He is also associated with various voluntary activities for social cause and has volunteered for Save Sharmila Solidarity Campaign. Save Sharmila Solidarity Campaign is continuously raising its voice to repeal AFSPA from North East and J&K since last many years. On November 1 and November 2, SSSC along with other organisations also organised a Convention on Repeal AFSPA at New Delhi and various other protests at many other cities. On the recent decision of Meghalaya High Court where the court directs Centre to impose AFSPA on Garo Hills, SSSC appealed all civil society organisations and political leaders to come forward and to appeal to court to review its directions and not to make common people victims of state violence with unchecked and unlimited powers of AFSPA.